Durable deciduous conifer adapted to colder climates and drier soils than those in its native Southeast. Best planted where it can develop unhindered, as it is naturally a large tree. Amazingly, it thrives from upstate New York to the High Plains of Texas and south to Florida. Lumber is highly prized for its decay resistance. 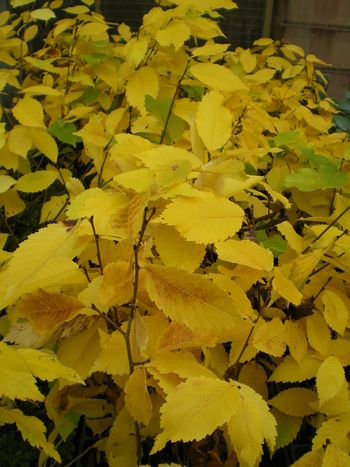 Despite its large stature, its landscape appeal is evident in its lacy foliage texture, which becomes a handsome, distinctive blend of green, yellow and brown in autumn. The shaggy bark and bold architecture of its branches lend striking winter interest. Trouble-free, easy to grow and transplant if root-pruned or containerized. 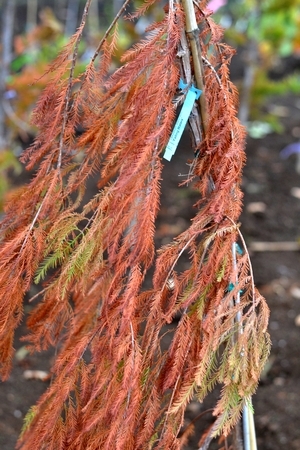 A weeping Baldcypress selection that distinguishes itself by its leader growing straight up while the branches droop. Fall color is bronze, and the reddish brown bark peels in strips. Tolerates both wet and dry conditions. Much superior to 'Cascade Falls' because it has an upright tendency as opposed to the groundcover character of the former. Not really a dwarf, but a slow growing, intriguing upright variety. Excellent rock garden plant or focus plant for a water garden, given that it tolerates flooded roots. Landscape designers love this clone for its stately pyramidal form. A fast grower with a broad spreading crown, it will get 50+ ft. tall but maintain a dependable central leader. A fast grower, it's much broader than Shawnee Brave. 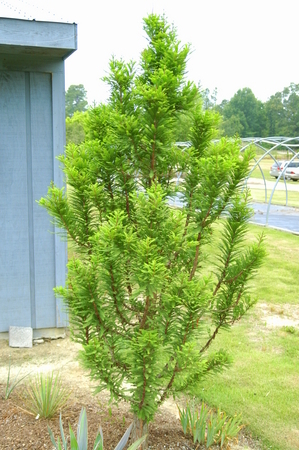 Narrow, perfectly upright form; mature size 70 ft. x 18 ft. with minimum leaf litter due to its fine-textured foliage. 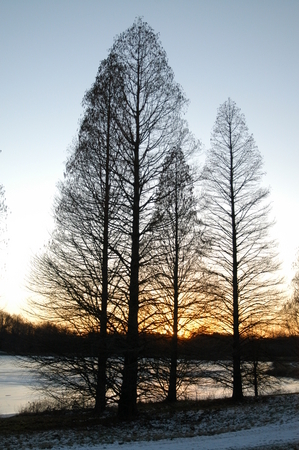 Lends an aristocratic air to the landscape, especially if several specimens are grouped like sentinels along a water course or pond. 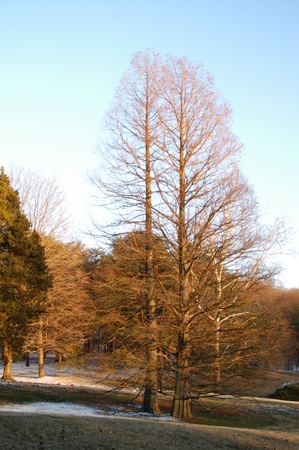 Chosen as a runner-up in the 2002 Urban Tree of the Year competition held by The Society of Municipal Arborists. 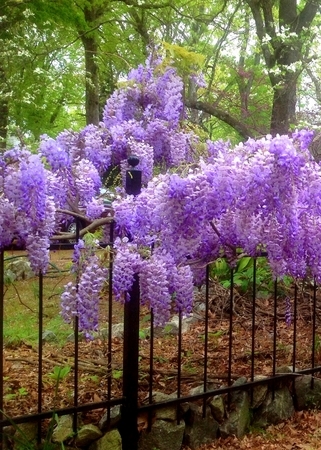 Selected almost a century ago by New Jersey nurseryman William Flemer for its aesthetic merit. By stroke of good fortune, 'Princeton' has demonstrated moderate resistance to Dutch elm disease. Typical of this iconic American species in form and hardiness, it is an important part of the American experience, a relic selection from America's urban forest history, still adapted to its future so many generations later. Released by USNA in 1995. With resistance to Dutch elm disease, though not immunity it bring back the classic shape of the stately American elm. Blooms 2-3 times during summer months. Cold hardy with medium green leaves and lavender-blue flowers on 10-12 in. racemes. 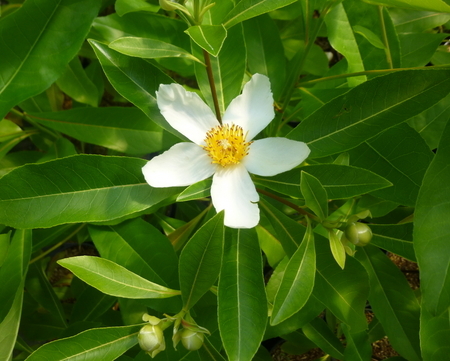 An exciting but seemingly unlikely combination this inter-generic hybrid from Thomas Ranney at NCSU combines the hardiness of Franklinia with the cultural ease of Gordonia. Early white 2 in. 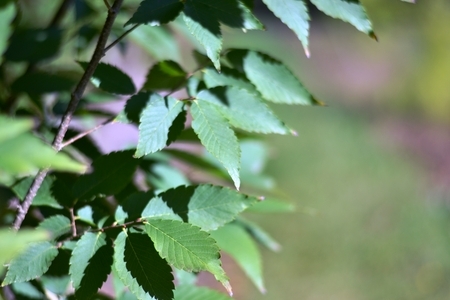 flowers, semi-evergreen foliage, and a robust tree-like growth habit make this an exciting new flowering tree addition to the trade. Growing quickly and branching sparsely, nursery training is important to get the best looking small trees in your nursery/ GC. Member of the Elm family but resistant to DED. Older trees exhibit an especially attractive bark. Vigorous in the nursery, these seedlings have been lightly pruned to encourage straight stems. Vase-shaped with graceful, outward-arching branches. Dark orange-red in fall. Somewhat hardier than Green Vase®.